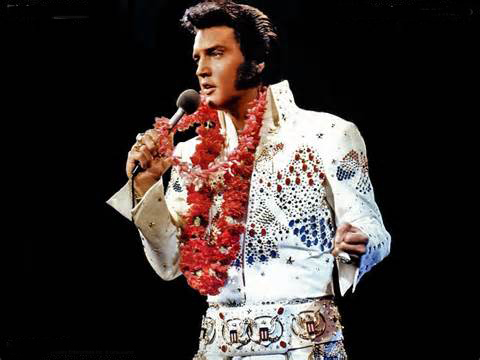 August 16, 1977 – Elvis Aaron Presley, more commonly known as “The King of Rock and Roll,” is arguably the single most important figure in the global spreading of American 20th century popular music. Besides pop and rock ‘n roll, he brought the blues, black music and gospel to the world. Born in Tupelo, Mississippi on January 8, 1935, he made his first public performance on October 3rd 1945, in a singing contest at the Mississippi-Alabama Fair and Dairy Show, dressed as a cowboy. Elvis had to stand on a chair to reach the microphone and sang Red Foley’s “Old Shep.” He came in fifth, winning $5 and a free ticket to all the Fair rides. He began his career as one of the first performers of rockabilly, an uptempo fusion of country and R&B with a strong back beat. On July 18, 1953, he went to Sun Records’ Memphis Recording Service to record “My Happiness” with “That’s When Your Heartaches Begin”, then on January 4, 1954, he cut a second demo recording of “I’ll Never Stand In Your Way” and “It Wouldn’t Be The Same Without You”. His novel versions of existing songs, mixing “black” and “white” sounds, made him popular and controversial, as did his uninhibited stage and TV performances. With his versatile voice he covered many genres, including rock and roll, gospel, blues, country, ballads and pop. In the 1960s, at the height of his popularity, he made no less than 31 movies. To date, he has been inducted into four music halls of fame. Throughout his career, he set records for concert attendance, television ratings and recordings sales. He is one of the best-selling solo artists in the history of music, selling over one billion records worldwide. Among his many awards and accolades are 14 Grammy nominations, with 3 wins, from the National Academy of Recording Arts & Sciences, the Grammy Lifetime Achievement Award which he received at the age of 36, and was named One of the Ten Outstanding Young Men of the Nation for 1970 by the United States Jaycees. Tragically he died from cardiac arrhythmia on August 16, 1977 at the age of 42 and was found death lying on the floor in his bathroom where he had been reading ‘The Scientific Search For Jesus’.